The Leading Economic Index Jumps 1 Percent: Is the Economy Improving? HomeBusinessThe Leading Economic Index Jumps 1 Percent: Is the Economy Improving? 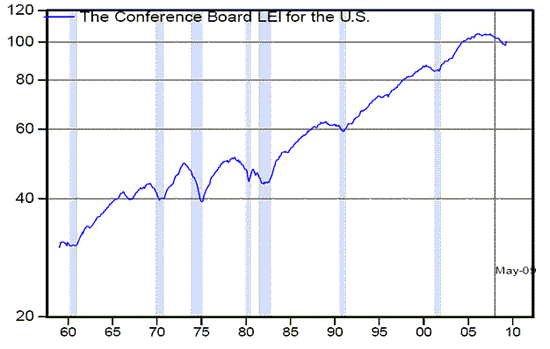 The Conference Board Leading Economic Index increased by more than 1% in both April and May. Since I’ve been scratching my head trying to find some confirmation for recent economic optimism, I was curious to take a look at what’s responsible for the favorable reading from the LEI. Leading economic index. Source: Conference Board. The monthly change in the Conference Board Leading Economic Index is constructed from a weighted average of 10 separate indicators. The index rose on average by 1.16% per month during April and May. 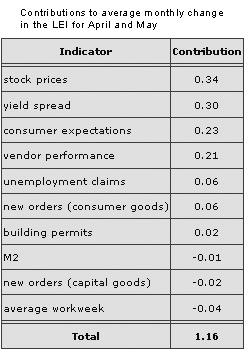 The table below identifies the contribution of each of the 10 components to this two-month average. Topping the list is the surging stock market. A 2.6% gain in the S&P500 increases the LEI by about 0.1%, so the 8.8% average monthly gain over each of the last two months contributed 0.34%, or almost a third of the total gain, all by itself. Second in recent importance has been the spread between the yield on 10-year Treasury bonds and the overnight fed funds rate. The LEI is credited with a 0.1% gain for the month if the 10-year rate averages 100 basis points more than the fed funds rate for that month. With the average spread about 300 basis points over the last two months, that’s contributed 0.3% to the monthly growth rate of the LEI. Whether that spread is in fact all good news is not clear. At least some of it likely reflects inflation or deficit worries, though Paul Krugman and Steve Gordon (, ) favor the “good-news” interpretation. Another important contribution is the rising spirits of American consumers, a trend I commented on (and worried about its prospect of continuing) in my previous post. These three indicators– stocks, spread, and sentiment– account for 3/4 of the rise in the leading economic index over the last two months. And they’re all based on what other people think rather than hard economic numbers themselves. The one solid positive that’s based on direct economic data is the vendor performance measure, which is also one of the components of the ISM manufacturing index. 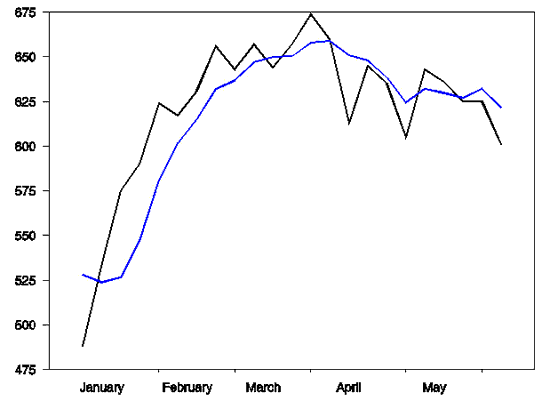 This is a diffusion index– a value below 50 indicates that the number of manufacturing supply managers who said things got worse last month outnumbered those who said they got better. The reported May value for the ISM’s overall manufacturing PMI was 42.8, while the vendor performance (or supplier deliveries) component used in both the LEI and the PMI was at 49.8. These are improvements over the more pessimistic numbers reported earlier, and any improvement in the vendor performance measure makes a positive contribution to the monthly change in the LEI. But it seems to me that it’s hardly time to celebrate as long as deteriorating reports still outnumber those of improving conditions. ISM figures that an overall PMI of 42.8 corresponds to about a 0.5% real GDP growth rate. If that’s the happiest real number you can point to, I wouldn’t feel too cheerful right now. 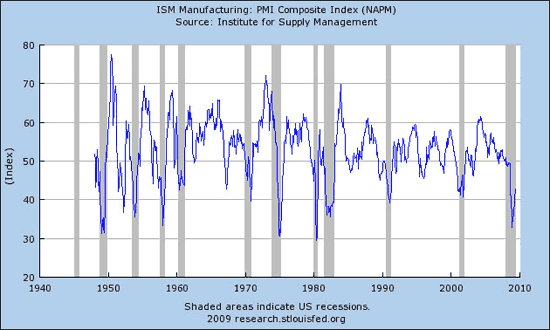 ISM manufacturing PMI composite index. Source: FRED. Apart from those 4 indicators, the remaining 6 elements of the leading economic index are sending pretty tepid signals. Among the more favorable is that coming from initial claims for unemployment insurance, an indicator we’ve been discussing at length. This indicator actually made a negative contribution to the May LEI, partially undoing the contribution to the 2-month average of the initial positive reading for April. So maybe we could summarize the recent strength in the leading economic index this way. The main reason we think the economy is improving is because many of us think the economy is improving. 1 Comment on The Leading Economic Index Jumps 1 Percent: Is the Economy Improving? I don’t think 1% is a big indicator. Although it may be better to be optimistic vs. pessimistic. Many would wonder though, if things are getting better, why are payments still hard to make, why is unemployment still on the rise?